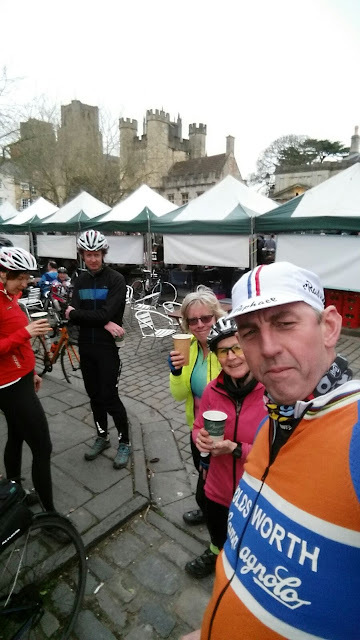 This year Audax Club Bristol, aka ACB, are organising some new Great Western Randonnées showcasing the West Country. The first one is Wells Mells and Old Rail Trail 100km with 1.5 AAA points for climbing. My entry was in back in January and I saw it as a lovely day out after the tough test of Gospel Pass Audax last weekend. A walk in the park. A stretch of the legs. Only 100km. OK there are some hills lumps in there. Also the small matter of 15km each way to start and finish. I managed to leave home by 8 as planned, slightly concerned about finding the cycle path on the new Bristol South Link Road. The signposted gate was open from Festival Way near Ashton Gate at the cow crossing place, and other than negotiating a couple of farm gates, as the route is also for cows to get to their fields, it was all quite straightforward. A nice wide separate cycle path, steady climb, far easier than the haul through Ashton Gate and Hartcliffe Way. Not too much urban sprawl after this bit 15km done and we haven't started yet. I am having problems with my gearing again, stuck in the small ring, not a big deal would be a none starter today if I were stuck in the big ring again. I've arranged to meet Lynette and Pete at Whitehall Garden Centre where the start and finish controls are. The normal routine of picking up the control card, a little self seal bag to put it in and greeting fellow audaxers from BRCC (Russ, Julian, Lynette, Pete, Robert and Yann) and other familiar faces from previous audax. The Weston Wheelers were out again. It is lovely to feel part of the audax "club" now. Everyone is open and friendly and not at all cliquey like some cycling sportives and events. Everyone is respected for turning up and taking part, never mind what gear or how fast you are. Lots of encouragement, and mechanical help if needed from fellow "daxers." We're all under way at 9, it's nice to be out of thermal trousers and wearing shorts and leg/arm warmers today although it is overcast. We are lucky with the weather, no rain today. 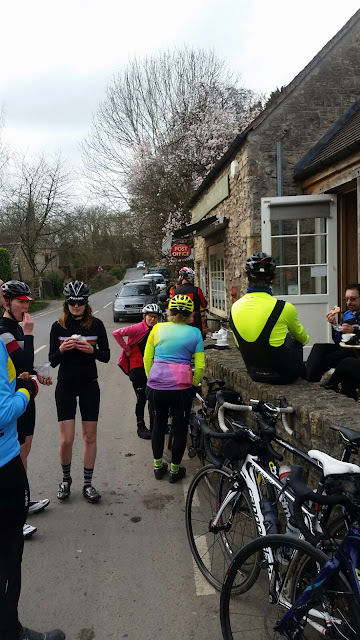 The first ten kilometres are quite sociable as we head south to the familiar territory of Chew Magna and down the west side of Chew Valley lake. Familiarity means you know the first serious test of the day, West Harptree Hill and I am deliberately plodding. I know from experience that trying to push anything early on is a disaster for me, it takes me hours to warm up to my best. Now we are going out of familiar territory. We walk through the Bishop's Palace by Wells cathedral and pick up the bike path through the town city in a south easterly direction. Lovely lanes but we skirt Shepton Mallet and push on to Bruton with Redlynch being our most southerly point, racking up some more stiff climbs, and we turn north easterly towards King Alfred's Tower. Some cheery soul (ACB organiser!) had chalked encouragement on the road, mentioning something like gradients of 15%, "come on audaxers you can do it. "It's a very tough climb, and a fair few cars and riders on the lane.I bottled at the nasty final kick and managed to walk up. Heroic Lynette cycled the lot. What a great spot, but flipping Alfred did get a few swear words flung his way. A pause for group congratulations, picture taking, chat, admiring of scenery and gulping water and bananas. Woo hoo, swoopy downhill bit. Well for 1/2 a mile. What a lovely part of the country. We wound our way up a steady climb and then a nice easy run into Mells, past Nunney Castle. 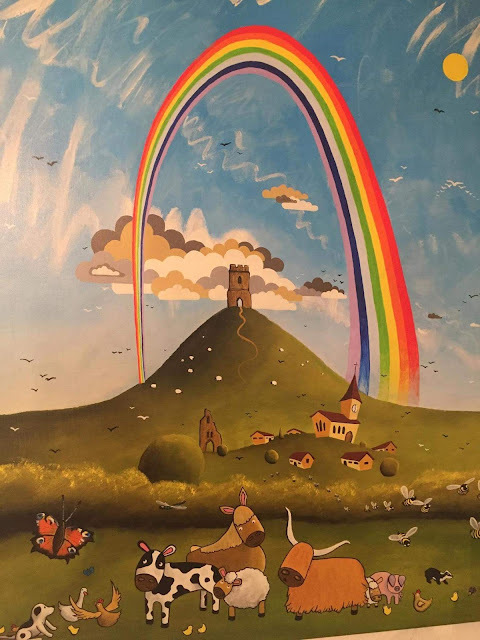 Our cunning plan worked well as we had left many people, who had arrived at the pub ahead of us, in the pub waiting for food, and the lovely community run Mells Café attached to the Post Office and village shop, had empty tables and only a couple of others waiting. Get in. Soup, sandwich and a huge pot of tea was perfect. I had got to the stage of needing real food, bananas, nuts and Nakd bars were not doing it for me now. The soup was spinach and purslane. I have never come across purslane before, but full of omega 3 and combined with spinach, meant Popeye and Olive Oyl had a very healthy lunch. I loved it! Not so sure of Pete's opinion mind. Yann kindly let me steal some of his leaves for my cheese sandwich, perfect! Mells Café Spinach and purslane soup as green as green can be. Not far now, but the last stage was lovely but quite punishing. We were glad to have eaten. This is the section incorporating the "Old Rail Trail" aka Colliers Way Route 24 of Sustrans National Cycle Network. What a find! I had no idea this off route trail was here, not that far from us, and unlike the Strawberry Line the surface is smooth tarmac and not grit. It was also downhill the whole way. We were careful as plenty of groups, families and dog walkers also out enjoying the traffic free path. It will connect up to the Bath Two Tunnels route, if it doesn't already. After that came the last 3 1/2 hills. A good test of the legs and I failed again at the top of the last one. Legs and lungs on strike. Oh well, not too much shame. The last few kilometres back to the Final Control at the start in Whitchurch. We beat the Weston Wheelers again by being cunning, not that audax are races or anything. Lynette beat me in the final sprint, grr. That was tougher than Gospel Pass audax last weekend! The garden centre staff were now packing up. All those people who have spent the day garden centre visiting and gardening, how knackering. I'd far rather do what we did. Tremendous day. Wells and Mells and Old Rail Trail Brevet card complete with motivational stickers and stamps. Lynette and I rode back home together in the drizzle, well to my house, she did an extra 10km on top again. Ride w GPS indicated 1300m climbing, we did 1900m! A well lumpy day over 130km. There is this theory about recovery rides, to stretch out after a long ride. I am not so sure. 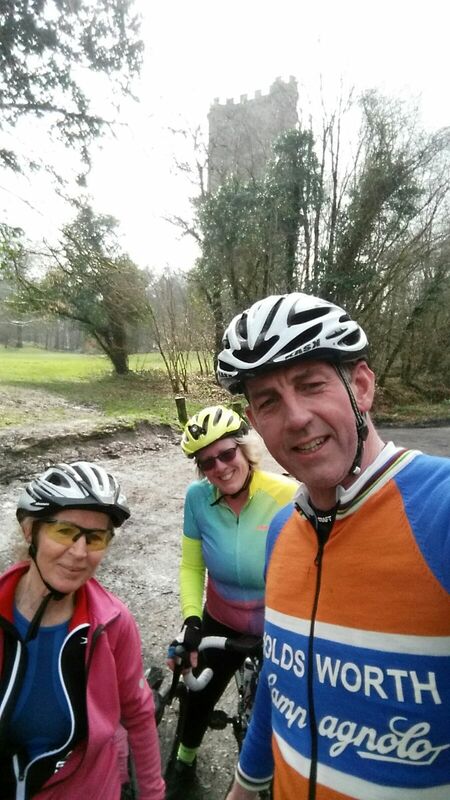 I had decided I was going to do half the BRCC Sunday Club run the day after the audax, as Steve was playing golf anyway. I was seeing it more as muti-day training. After all we rode day after day after day of hilly riding in Scotland last summer, and I need to get fitter, stronger and faster. It took 5 miles warm up to get my knee to rotate properly again. I load up an amended route and as I am awake head off out to Backwell at 8 to meet the BRCC crew. Lynette turns up on foot, declaring that I am crazy, but Julian is there, he did audax plus extra to make 100 miles yesterday and is doing the full hilly route today. Julian is a machine! After buying more bananas, and sharing them out as I couldn't carry a whole bag, off we set, at a leisurely pace for the others and a lick for me. 25km chasing round the Yatton flatlands. The test is Burrington Coombe. Off they all shot, I set a record, for my slowest ascent ever. My right (replaced) knee is very swollen and sore and I have burning legs. I said goodbye to the others heading off to Wookey Hub café, and looped off round from Charterhouse and descended down West Harptree Hill (reversing yesterday's route) to Chew Stoke. I had meant to reward myself with coffee and cake at New Manor Farm cafe on the eastern shore of Chew Valley lake, but in my haste I shot down the west side and couldn't face going round. Not even for cake. That is two cycling weekends on the trot I have not eaten cake. Heroic or what? My legs were not co operating so I went the fastest way home, the drag up to Winford was painful and slow. Last whizz down to Barrow Gurney and along the shocking state of Wild Country Lane and home. Pleased I went out, but not sure I achieved any extra fitness nor recovery! I spent the afternoon in the bath recovering properly. 190km and over 2000m climbing this weekend. not too shabby. I did 66.6% of BRCC ride in terms of distance, height climbed and speed of the others!